A Diamond Select Toys release! The wisdom of Solomon! The strength of Hercules! 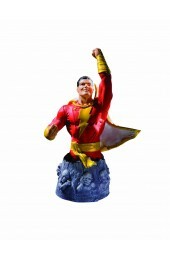 Billy batson alter ego shazam is the next entry in the DC gallery line of PVC dioramas, and this approximately 11-inch sculpture captures the hero in a split-second, grabbing a bolt of lightning on its way to the ground. With a feature film in the works, shazam is poised to ride that lightning back to stardom, and this amazing sculpture celebrates the characters GODLIKE power! Sculpted by Joe Menna based on a design by Shawn Knapp. Packaged in a full-color window box.